In the early 1900s, the population of Southern California exploded, and the cities grew at such a rapid pace that builders could hardly keep up. Among those who settled in the area were ten architects looking to make their marks on the world. Claud Beelman, a man who never received a college degree, would go on to design the Elks Lodge in Los Angeles. Albert C. Martin, architect of Grauman’s Million Dollar Theater, founded a company that is still going strong more than one hundred years later, and Julia Morgan, the first woman architect licensed in California, was hired by William Randolph Hearst to design the Examiner Building. 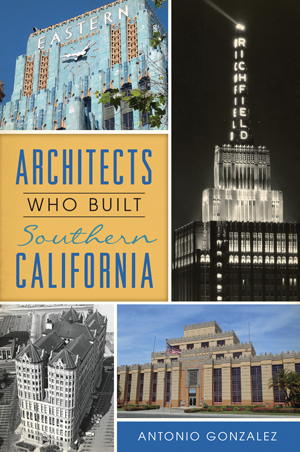 Join author Antonio Gonzalez as he tells the stories of the people behind some of Southern California’s most iconic buildings. Antonio Gonzalez is a resident of Los Angeles. He has a BA in journalism from the University of Iowa and an MLIS from San Jose State University and is currently enrolled in the Heritage Conservation program at USC. He is a member of the Odd Fellows fraternity, works in an architecture and fine arts library and has a blog where he post items related to architecture and his other interests (misterdangerous.wordpress.com).